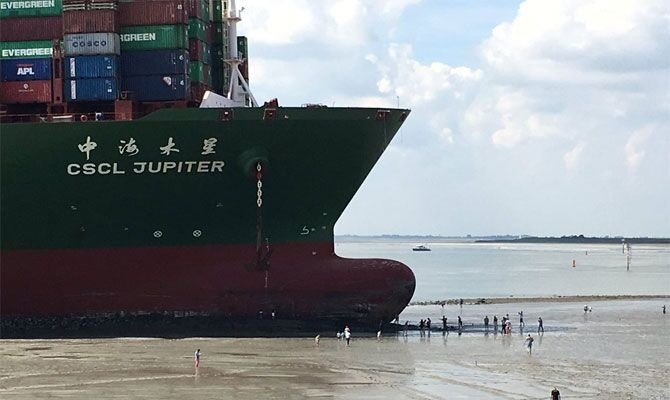 STRANDED SHIP IN BRAZIL-SUDDEN DROP IN THE SEA LEVEL ! One of my readers from Brazil, sent the following photographs. If, what she told me, is proven to be true, then the information is absolutely staggering. The sea around the Brazilian coasts and that of other South American countries is dropping in depth, both drastically and suddenly! This is not something that so-called Global Warming or Climate Change would cause. Global warming if it exists at all, would actually cause the seas to rise and not fall. Unfortunately, there is much more evidence that the planet is actually getting colder, and has been for quite some time; at least the past 20 years or so. Many scientists believe that we are entering an Ice-Age or at least a mini Ice-Age. In the case of an Ice-Age the sea levels would indeed go down, but probably not as drastically and abruptly as reported happening in Brazil. My source states that this event is not actually being reported in the main Media.- typical. Of course, the main media like to maintain the illusion of Global warming, as the Elite make hundreds of billions with the deception of global Warming. All the investigations that I have made over the years, concerning the topic of Climate Change, all show one thing:- We are headed for an Ice-Age, which is exactly the opposite of what the Main Media are proclaiming. Could it just be that the powers that be, already know that we are headed for an Ice-Age, and desperately want to avoid a panic? Why because an ensuing Ice-Age could prove to be much more devastating to mankind than Global Warming. Is it just possible that over the past 60 years the Elite have tied to stop the coming Ice-Age with crazy policies? I know as a fact that the USA DROPPED MANY ATOMIC BOMBS ON THE ARCTIC IN THE 50’ AND 60’S. WHY? Were they trying to melt the ice permanently? 1200 years ago there was no ice on the continent of Greenland. There are maps from ancient times showing the Antarctic totally free of ice. How could a map like that have been taken except from outer space or very high up in our atmosphere. I have articles about all these intriguing subjects, which are already on this website somewhere. I will start to LINK to t hose articles shortly, so keep watching this space. My new Newsletters will be for the purpose of LINKING up the 120 different TOPICS on this website, which has taken me almost three years to collect, and is in reality an encyclopedia of true information. As someone wisely stated years ago: ‘If you want to know what the truth is about any given issue, just see what the majority of the people are stating about the subject-matter, and the truth is normally the exact opposite! That has certainly been my personal experience with the Main Media, which thinks nothing about lying and hiding the truth in order to make more money and to serve their masters the Elite players of this current world. I will try and get more information from Brazil about the SINKING OCEANS, which as stated above is one of the signs of an Ice-Age.